Playing Noccer Soccer at Swisher Courts in Lake Dallas. Not sure if you have heard of Noccer Soccer yet, but I’m sure it won’t be long till everyone does. I think of it as a cross between bumper cars and soccer except that you are the car. Noccer Soccer is like playing soccer, but without rules. Well there are some rules, but more just for safety. 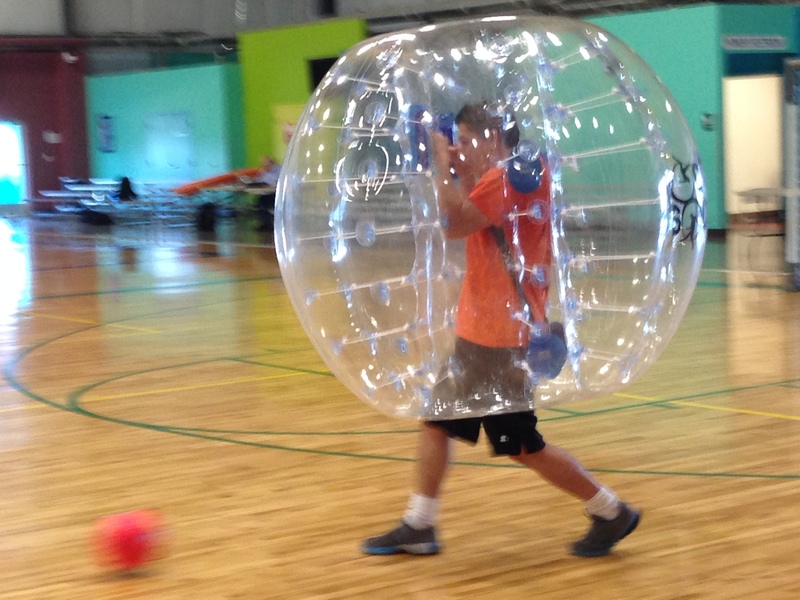 You play 5 vs. 5 soccer on a basketball court while wearing a 4 ft. round bubble. Tucked safely inside, you can use the bubble to protect yourself and use it to hit others. If you get hit and find yourself off your feet you can just tuck your feet and roll till you come to a stop and then you can get up and keep on playing. I had seen video of it on the internet before and thought it would be really cool to play. I got a chance to this past weekend at Swisher Courts in Lake Dallas, and it was more fun than I imagined. There is just something that brings a smile to my face as I hit someone going for the ball and completely knock them off their feet. My girlfriend got to play too and unfortunately I ended up taking her out one time. I hit a guy so hard he flew into her and knocked her off her feet. It was so funny. That’s one of the major pluses of this game. You will have some much fun playing and laughing. This is great fun for any group. I wouldn’t mind if this some how could have league play. I could dedicate one day a week to this. If you want to see some highlights of the game in action, here is a video of us playing Noccer Soccer.